How efficient is your furnace? Out of the 43 million residential oil and gas furnaces in operation in US homes, the statistics say, one in four is over 20 years old. Many new furnaces on the market are 25% to 40% percent more efficient than older models. Contact RPM today for a free consultation and evaluation of your current system to determine if it needs an upgrade. We also provide service and inspection for air-conditioning systems. Contact us to have a NATE (North American Technician Excellence) certified technician inspect and clean your air-conditioning unit. The best way to ensure your system is emitting cool air and running efficiently is to have a precision tune-up. A clean air conditioner can save you up to 10% of your electric bill, so it's a smart idea to have your system checked out. 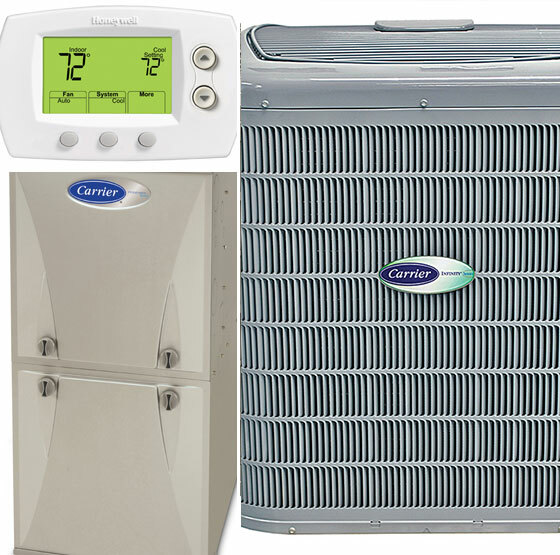 We strive to install the most efficient forced-air heating and air-conditioning systems. This includes installing programmable thermostats, which allow you to set temperatures for when you aren't home. We can even install zone thermostats with motorized zone dampers, which allow you to have customized temperatures in different parts of your home. A programmable thermostat allows you to fine-tune the operation of your heating system so that you don't waste energy by running the system when heat isn't required. You can set a programmable thermostat to turn the heat down to 61° while you sleep, bring it up to 68° a few minutes before you rise, turn it back down when you leave for work, and return it to a comfortable level just before you come home. Using a programmable thermostat is one of the most effective steps you can take. Filter maintenance is an important part of your HVAC systems functionality you should clean/change your filters on a quarterly basis to avoid restricted air flow. To keep your air-conditioning system in excellent condition, it is important to keep it free of debris. If you keep grass clippings, leaves, shrubbery, and debris away from your outdoor unit, it should only require a basic maintenance cleaning and check to operate properly. Also, make sure your outdoor unit stays in a level position. If the support for your unit shifts or settles and the unit is no longer level, it will retain moisture and not drain properly.